The basis of the protocol on Total Brain & Body O2 Therapy is to induce O2 deprivation and then once recognized by the software data, flood the body with O2 saturation and take advantage of the vasodilation/saturation by pushing it to as much tissue as possible via exercise (in this case our NordicTrack® Commercial VR21 recumbent bike). 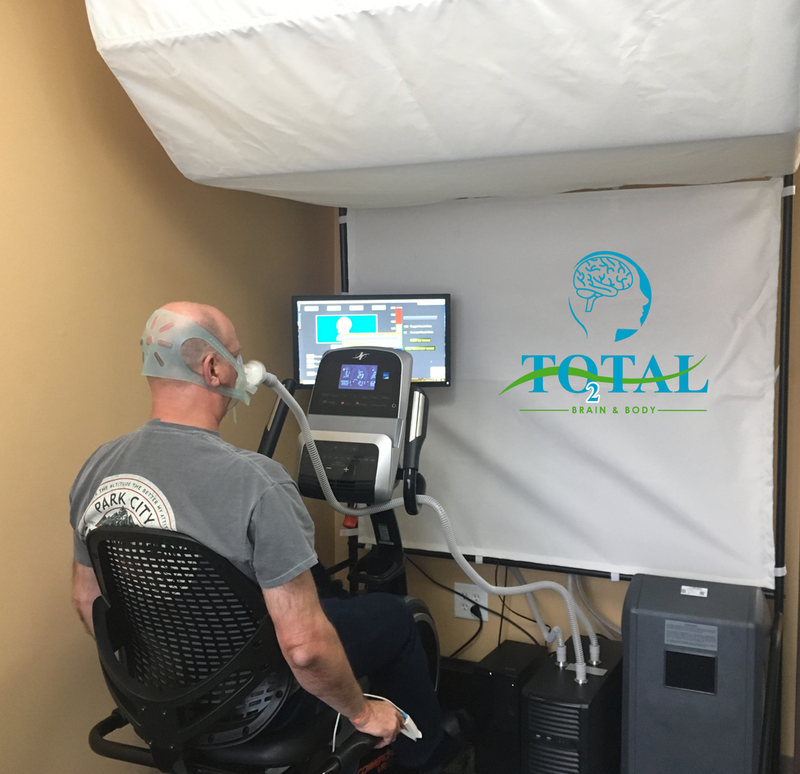 Total Brain & Body O2 Therapy is designed to facilitate healing by super-saturating nearly all body tissues (especially brain, kidney, liver) plasma and lymph with very high levels of oxygen that permeates the tissues because of the exercise component. The PFC is the region of the cortex behind the forehead. It plays a central role in making decisions, formulating and carrying out plans and intentions and sticking to those plans in the face of distraction. For example, suppose it is time for your evening meal. Your PFC will formulate a plan for meeting that need. Your PFC accesses the knowledge you need such as your memory of where you keep your pots and pans as well as the ingredients for the meal. Suppose the phone rings while you are cooking – you decide to answer it, your PFC will hold your intentions to finish cooking the meal so that you can come back to cooking when you are done. The PFC also has the ability to inhibit other areas of the brain connected to emotions, enabling you to, for example, override a fear of heights when you need to climb a ladder. In summary, the PFC controls attention, blocks distractions in the environment, controls physical and emotional impulses and helps access your memory. However, in order for the PFC to function properly it requires blood flow to supply it with the nutrients necessary for metabolism. Studies have demonstrated that some individuals have limited blood flow to this area of the brain. For example, children and adults with ADD/ADHD have a decreased blood flow to this area of the brain. Whereas the goal of neurofeedback is to train the individual to produce and/or inhibit certain brainwaves, the goal of Total Brain & Body O2 Therapy is to increase blood flow to the pre-frontal cortex (PFC) and the entire brain. Increasing the amount of blood to the PFC will result in increased metabolism thereby allowing this area of the brain to function optimally. Like neurofeedback, Total Brain & Body O2 Therapy is completely non-invasive and drugless. ADD/ADHD is a real neurological disorder and typically results in dysregulation of the PFC. Brain scanning studies have shown different activity in the PFC of children and adults suffering with ADD/ADHD. These scans have demonstrated a deactivation of the PFC during tasks requiring concentrated attention, for which you would normally see an increase in PFC activity. This deactivation results in the symptoms commonly seen with this condition. The benefits reported by users of the Total Brain & Body O2 system have been described as significant include improvement in cognitive function, executive function, and motor control. Now doesn’t that sound fantastic for improving brain health?